NEW DOODLE PUPPIES!! JUST BORN BABIES!! I have had many people call to speak with me about adopting a puppy and confusing Labradoodles with Goldendoodles. I found after breeding and raising three labradoodle litters many years ago that I prefer the Goldendoodle puppies. 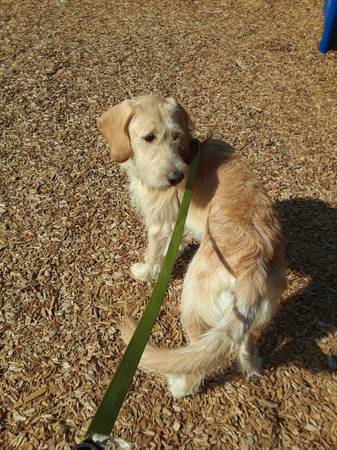 Goldendoodles have a Golden Retriever / Poodle lineage. Labradoodles have a Lab / Poodle lineage . I have never been a fan of Labs except as a hunting partner, so it just stands to reason that labs are not the breed that I have chosen to raise as companion animals. I love the Goldendoodles looks, their temperment, their soft coat, the loving personality and WOW , Goldendoodles are so smart and easy to train! 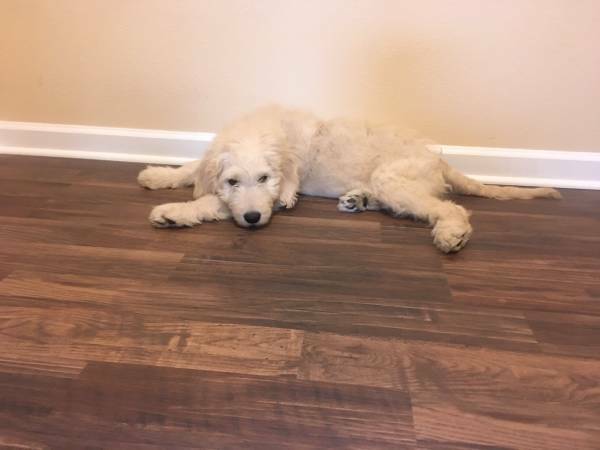 So here at Crazywomenkennels we raise our choice which are the Goldendoodle babies! Below is a photo of a Goldendoodle, and a photo of a Labradoodle. These puppies are approx. the same age and both are gold/ cream. Both have a poodle as one of their parents. That is where the similarity ends though. You can easily see the physical difference as one puppy has a lab parent and one puppy has a Golden Retriever parent. Their coat, their build, their head shape... all are different. NEITHER PUPPY BELONGS TO ME OR IS FROM MY KENNEL.